From the moment you step into the Grand lobby of this 4 Star hotel with its marble floors and barrel vaulted ceilings, you will be surrounded by the historic elegance that sets the Charlottetown-A Rodd Classic Hotel a class apart from all other island hotels. Built in 1932 by CN Railways, the hotel features the elegance and attention to detail synonymus with the historic Canadian Railway Hotels. The 115 newly renovated guestrooms and suites are tastefully decorated with fine impeccable replicas of period furnishings, draperies, and linens - a truly distinctive hotel guestroom. Out private 5th floor boasts spacious 2 room suites with large soaker tubs and some fireplaces and jacuzzis. All guests have access to a common living room and roof-top garden with extraordinary views of the Charlottetown Harbour. In the middle of the old world charm, guests will enjoy the convenient amenities of the indoor pool, fitness centre, sauna, and whirlpool. The Rodd Charlottetown is located in the downtown core. 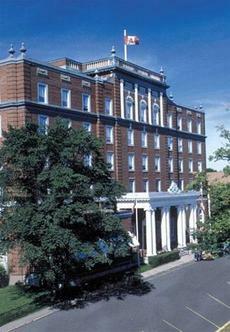 Only a 1/2 block away from the Confederation Centre of the arts, shopping, and business districts of Charlottetown. Park your car in our complimentary parking lot and explore Charlottetown by foot. Inquire about our many vacation packages including golf, theatre, and romance packages.